I would absolutely recommend Mt.Hood Ski Camps. Last summer my son learned so much there. For one week his skiing skills improved so much, it was unbelievable. He skied on a whole new level the last season. He got inspired and now he is a freerider looking forward to compete next season. Can’t wait to see the improvements from this week in summer camp. My son went for a week last year and loved it so much he is returning for 4 weeks this summer, and convinced his sister and 3 friends to come along. This is heaven on earth for any kid that loves to ski. This is our son's 2nd year and daughter's 1st year. They LOVE it and can't wait until next year. They keep them so busy, lots of activities, and great skiing! Thanks for taking such great care of our kiddos! See you next year. This was my daughter's first time and as soon as we picked her up, she wanted to go back. So much fun and she learned a lot. Thank you for a great program! See you next year. 5. The Food- I always thought that camp food was junky, but MHSSC really knows what they are doing. The food is great! 4. The Location- For skiers and snowboarders in the US, being able to come to Mt. Hood is beyond amazing. And a plus--it's in the summer!!! Oregon is great because you can ski until 12:30, and when you come down, you can go windsurfing, whitewater rafting, rock climbing, cliff jumping, zip lining, and so much more cool stuff! I love that! 3. The Coaches and the Counselors- Are now my favorite people on Earth. Besides knowing everything about safety, they are there to make you feel like you are at home, and they definitely know how to! Everyone gets homesick when they go to camp, and the counselors know about that. They're awesome. The coaches have enthusiasm and excitement, which gets you pepped up on a slow day. They give great advice, and video analysis is the best! I bought my videos to take home so that I can show my parents how much I improved! Thank you coaches and counselors! 2. The Lodge / Campers- The lodge is super awesome, because you can do so much. There are tightropes, unicycles, a trampoline, a GaGa pit, a tuning station, a pool table, and so much more to name. Everyone hangs out after skiing, and the rooms are so fun to just sit around in. I love MHSSC! 1. The Community and the People- I cannot say enough how incredible MHSSC is, even though this is the theme of the last two. Everybody is there to have a great time and improve, and I know so many more people now who have great motivation and skill. The lodge is great, because everywhere you go you can talk to someone. The GaGa Ball pit. I am definitely building one because that game is so much fun, and nobody gets upset or angry like other games, and everyone has a chance to win! The trampoline is so helpful to freestylers, but also a fun place for racers! When you hear the encouraging, "Take it to snow!" or "Try a front flip this time," you can understand the kind of people who come to Mt. Hood. Everyone is there to help you, and relationships last a lifetime. Anyway, this was all to say I had the best time at MHSSC. Thank you so much Mike. Just a quick note to say thank you, to you, and all of your staff...for the wonderful time, instruction, and experience, that my daughters had with y'alls crew this summer. They are already planning for three-weeks next year!!!! Thank you again! See you next year! I was just thinking of how much fun I had last week at your camp and thought I would send a quick e-mail saying thank you. I can’t give enough praise to Roger and his excellent coaching and also the overall camp experience. Thanks again and I hope to see you both next Summer. Mike – Jack Havens had a fantastic time at camp the last two weeks. He is very confident in the skill he gained. He is already talking smack on how he will be able to beat his coach this year. Plus he has mapped out a multi-year plan to become a counselor. That’s if you approve of him! Thank you, he had a great time and I’m sure we will see his achievements on the slopes this season. See you next year! I wanted to drop a quick note to you in regard to our experience with Mark Stegall this past weekend. My girlfriend and I are fairly new to snowboarding and are more or less self taught. We have been boarding for just over a year and still consider ourselves to be beginners. As we are both professionals and in our 30s, we are a bit more careful when it comes to boarding than some younger riders because any major injury would effect our business and livelihood. We took an introductory lesson to snowboarding when we first began boarding at our local slopes but found them to be only moderately useful and have been winging it since then. We finally reached a point where we felt that we needed more professional direction and signed up with your company for 2 days of lessons at Mt Hood...As far as our snowboarding hobby goes, those two days have changed our lives. Thanks to Mark, we wouldn't even recognize the snowboarders we were when arriving at Mt Hood. From the first minute to the very last Mark gave us very specific and very useful information that destroyed the inefficient way in which we had been previously boarding and rebuilt a new and very solid foundation on which all of our future boarding will be based. Mark's patience, intensity, genuine love of the sport and love of precision and performing this sport the RIGHT way is something I haven't seen before and really appreciated. The important thing is that we not only appreciated Mark's approach and demeanor, but it was truly effective, simple to follow, and produced immediate results! I feel that we came to Mark trying to hammer nails with a screwdriver and Mark introduced us to the hammer. We certainly aren't experts yet, but Mark provided the correct tools and the knowledge of how to use them so that as we go into the fall 2009 season, we will be able to practice and use these tools to improve our technique as well as simply enjoy our time on the slopes more! Even beyond simple training, Mark gave us a lot of personal information regarding his experience with equipment and even allowed me to use some of his equipment when mine was creating problems! I now have a much better idea of what I need and how to make the most of what I have thanks to Mark's guidance in this area. We have not had any experience with your other instructors, but even so, we can only believe that Mark is a Rock Star in your group and a true asset to your business! We expected this to be a one-time trip, but thanks to the amazing experience Mark gave us, this will be at least an annual trip if not more often! You will certainly be hearing from us again and we are looking forward to more instruction from Mark in the future! I apologize for turning this "note" into a book, but I simply can't tell you enough how much we enjoyed the experience and how much Mark helped us! We would like to thank you, your instructors and counselors for the wonderful time our daughter Veronica had in your camp. She only turned 12 past spring and she never traveled alone before. You can imagine how relieved we have been, when she called from the airport, that everything was o.k., the counselors met her as promised. She called couple more times to tell us how happy she was in the camp. When she returned home we could only hear that everything was "AWESOME": snow, skiing, her instructor (Heidi), her new friends, and especially the afternoon activities. We knew about the camp only from DVD. Veronica's experience far exceeded our expectations. Great job, your camp is excellent! We have already skied several days this year, and I could see the progress Veronica made since attending Mt Hood camp. She cannot wait to return next summer. Thank you for your dedication and efforts. We would gladly give references to anybody, if they need one. My daughter Jordan Hanchulak spent a week at your camp recently. It was truly the time of her life. She can't stop talking about it. I want to thank you for that. BTW - Mac had a great time (it was his second year) and just raved about his experience on and off the hill. It truly is one of the highlights of his year (including his regular winter days!). I want to thank you all for the wonderful experience that my daughter, Sara, had at your camp this summer. (She attended sessions 7 & 8) She learned a lot, had lots of fun and made some lasting friendships! (We already had one camp friend come to visit when his family was visiting the Boston area at the end of the summer!!) She is trying to figure out how she can stay for longer next summer! Thank you again!!! Dear Mike & Lynne, I had so much fin at camp, thank you! I truly enjoyed myself. I am so happy I got to meet such great people. Every thing about camp was great, the food, the coaches, counselors, the activities, the lodging, the directors! Thank you soooooooooooo much! Love always Laura Pozzi. P.S. The skiing was great too! John Rust was a great coach! I think that I learned a lot from him. Just wanted to thank you again for everything. I haven't spent a better week in a lifetime than last week. Learned so many new things. Met great people. And found a place that I'll want to come back to year after year. It's only been a few days since I got back home and I've been sleeping for most of the time. Really got a lot accomplished in one day at Mount Hood. I learned so many new things that I can share with new friends, things I was always afraid to try before attending your camp. Skiing was a blast, however, being able to go rock climbing and whitewater rafting after the ski day had come to an end was even better. Both of these I had not done in the past. Tried rock climbing twice. Made 2 attempts on the first day and 1 on the second. Please thank John Rust for pushing me so hard. The view at the top of the climb was nothing less that exhilarating. Whitewater rafting was great too. Didn't want to fall in since I'm not that great a swimmer, but the thrill of just being out there with a group of people having fun really is a great feeling. Thank the counselors. Bret, Liz, Sage, Allison, and any others that I may have missed. And all the kitchen staff. Meals were way more than I had ever imagined. Anyway, the long and the short of it is that I would really like to be out there right now, but work in the city required that I return to the East Coast. As I said to Bret just prior to hopping the bus for the airport, if I don't call you, call me. Couldn't miss another great season at Mount Hood Summer Ski Camps. God Bless and keep up the good work. Greg had a great time at camp and was telling us on the ride home about coming back next year! So thank you once again for your patience , follow up and running a fun program for these kids who love to ski! I will and have recommended it to many fellow ski families. thank you for a wonderful week. colette, jolie, angele, genevieve and myself all had a truly wonderful and awesome experience. 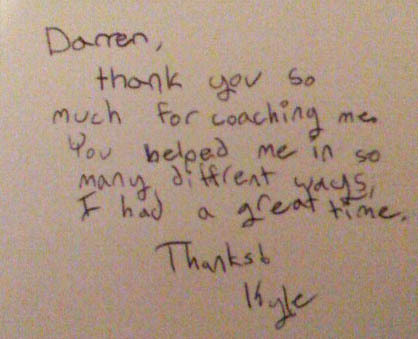 the coaching was far beyond what i thought it would be. All of the coaches are passionate and incredible. You have a first rate operation and i admire your dedication and passion. To ski every day and have such wonderful weather and to do incredible activities in the afternoon is mind boggling. It reminds me of my younger days. We will definitely be coming back next year as one week was not enough. You're camp was the highlight of our summer and hopefully the prelude to a successful ski racing season for our family. Tanner is having a GREAT race season! Your camp is amazing! A week at MHSSC has helped me so much. Not only did i learn what i wanted to learn, regarding the basics of tricks but I also learned actually how to ski. My skiing got better day by day, with Nolan making sure I was doing things right from the ground up, instead of just taking me straight to the park to land on my face. I'm so grateful of the time with Nolan and Jasper and it was a true blessing to be the only one on the course to get pretty much 1 on 1 with Nolan and Jasper filling in with good pointers and motivation. Priceless....well at least more than the $$$ i paid. Both quality, genuine guys and a credit to you. MHSSC was a comfy family place, clean and well kept. Really have no bad words to say about anyone or anything about my time there. Kai had the best time! He said on a scale of 1-10 it was a 12! He made some great friends! Thanks for providing such a great experience for him! Memories for a lifetime! Dear Mike, Thank you very much for the excellent two week camp the boys had on Mount Hood. They both feel they have learnt a lot and enjoyed that afternoon activities and making new friends too. Lynne, thank you sooooooooo very much.......Bryan hasn't stopped talking about his spectacular week at the camp. he's been praising all the people involved and just keeps saying....."it was SO LEGIT"!!!!!! Great! Thanks Lynne. Again - thanks for doing such a great job with the kids. My husband and I have been involved both with Fiorini Ski School and CMAC over the years - and had shared Mt. Hood stories with our kids - it's nice to have one of them finally understand how fantastic summer skiing on the glacier can be..... and you guys are the best. Thank you again Mike and Lynn for the wonderful kindness you have showed the Gillis family. I know Noelle is a much better young lady for the experience of being part of MHSSC. You have my heart-felt gratitude and appreciation for the opportunity you have provided for my daughter, Noelle. Hi Mike, From everthing Kristen has told us she had a great time at Ski camp. She has already asked to go for two weeks next year.